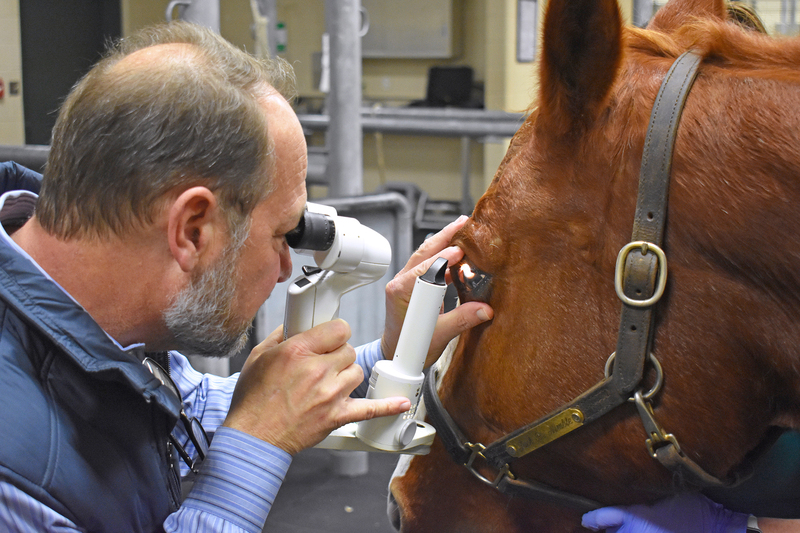 Dr. Phillip Moore, a professor in the Department of Clinical Sciences, conducts an ophthalmology examination on an equine patient. Auburn University’s College of Veterinary Medicine Teaching Hospital ranks high nationally for its quality of medical services and expertise, according to a recent survey of referring veterinarians and clients. The college’s teaching hospital scored above the national average for among its counterparts and with medical providers in nearly all ratings areas. Its only shortfall involved communication from specialists about case status and consultations, and measures have been enacted to correct that. The Veterinary Teaching Hospital includes the Wilford and Kate Bailey Small Animal Teaching Hospital, the J.T. Vaughan Large Animal Teaching Hospital and the Auburn University Veterinary Clinic, a community practice. The mission of the teaching hospital is to provide the clinical education third- and fourth-year veterinary students need for a comprehensive education, as well as provide specialty service healthcare to animals. Faculty in the college’s Department of Clinical Sciences teach senior-level students in the teaching hospital’s 16 specialty service areas, serving as clinicians providing animal healthcare, along with residents, interns and veterinary technicians. The survey of referring veterinarians was conducted by CalPro Research, a professional customer service and engagement measurement organization based in Rocklin, Calif. The survey scored 12 key areas: Ability to get into desired special specialist; Responsiveness to inquiries; Timeliness and punctuality; Level of compassion; Communication of staff; Communication of specialists; Case consultations and recommendations; Quality of medicine; Updates on patient health and case progress; Clarity of instructions for follow-up care; Perception of client’s overall experience; Value for fees paid by clients. “Overwhelmingly, the quality of our medicine was our greatest strength (81 percent),” Dr. Allen writes in a survey results summary to participating veterinarians. “We are pleased to report that our scores for level of compassion (62 percent) and perception of your clients’ overall experience (49 percent) are above the median ratings as compared to other referral centers across the country,” he continues. Although Auburn scored above the national median, there still is much room for improvement, adds hospital Administrator Kristina Photakis. According to both polls, Photakis says communication is by far the area of greatest need for improvement. Directly related to survey responses, the hospital also has eliminated its fee-based online-consulting charge for Oncology Service cases, and now provides routine telephone or email oncology consulting with no fee charged. However, there is a $50 fee charged for a written report. “We also know that we are weak in the area of our Orthopedic Service, but we are actively interviewing and recruiting to hire qualified orthopedic surgeons,” Photakis said. Dr. Allen notes that survey participants do so anonymously, however, personal feedback is always welcome.